It was estimated in 2012 by the U.S. Department of Justice that 30% of prisoners have a form of a cognitive disability. Autism was included within the list of cognitive disabilities; however, there were no data that specifically indicated how many people within the autism spectrum are in the prison system. It has been proven that people with autism are known to give false confessions and that law enforcement agencies should be trained in how to question a person with autism spectrum disorder. When my son was 22 years old, he was questioned by our local police department and coerced into a false confession. He was told if he didn’t confess, they could charge his mom with the crime. They also tried to befriend him by asking questions about his website, telling him that they had visited it. These are tactics that can confuse a person with autism. Unfortunately, many law enforcement agencies are unaware of the issues that can occur with questioning people with autism. In my son’s case, when the police arrived at our home with a search warrant, I told the officers that my son had autism. Despite my having told them, the day after the police raid on our home, two police officers questioned him alone. They spoke to me about his autism before questioning him, and they asked me how much he understood. I told them that he would have to be evaluated by an expert, because I did not know the answer to that question. Despite my answer, he was interrogated without an autism advocate or lawyer. According to the paper, people with autism can give misleading indications of guilt because of a sophisticated form of echolalia, trickery and deceit, and believing that the police officers are authority figures. This creates a justice system where all autistic individuals are at a disadvantage due to the special techniques that police officers and other law enforcement personnel apply in questioning them. Furthermore, we were told by my son’s lawyer at the time that he would not bring up autism during his trial because autism can’t be used as a defense, nor could his family testify on his behalf. His lawyer would not use it to explain his false confession either. The justice system does not allow an individual with autism to use a diagnosis as a defense, which also means that autism is not a viable reason for a false confession. It’s a catch-22 situation! The judicial system seems to be set up in such a way that people with autism are overlooked by a blind spot that erodes their ability to receive the same justice that people without disabilities receive. How can the justice system still continue to ignore the plights of people with autism within the current legal system? Is it justice for all or justice for some? I find it disturbing that many law enforcement agencies have not been trained in how to deal with people with autism or how to question them. It’s even more shocking when we realize that autism currently affects 1 in 68 people. Why hasn’t the justice system started to train all law enforcement agencies? 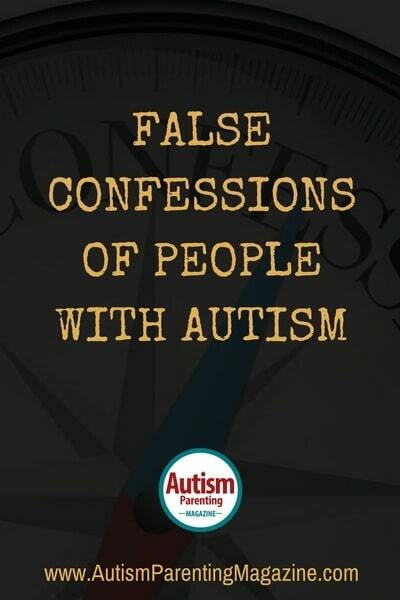 How many false confessions have people with autism made? There are autism response cards that can be purchased or printed from your computer that explain about autism and that people with autism are at risk of making a false confession. These cards can be given to a police officer, fire fighter, or EMT technician in the event of an emergency. People with autism should not answer the questions until they are able to get a lawyer. I wish that I had had this information back when this happened to my son, because none of this would have ever happened to him if I had been prepared with what to do in the face of a legal situation. I was ignorant at the time that this happened to my son, so it is very important to educate parents with children with autism spectrum disorder to prevent this from happening to others in the future. There are also other changes that can be made within our legal system to assist people with autism during their questioning by the police, either as a suspect or as a witness. I read a paper called Police Interviewing of Witnesses and Defendants with Autism: What is Best Practice? and learned that the United Kingdom has registered Intermediaries, which are communication specialists that are able to assist in the interviewing process of individuals with autism. These Intermediaries can be psychologists, speech and language therapists, social workers, teachers, or nurses who have completed training organized by the UK’s Ministry of Justice. Their role is in helping to assist with the communication difficulties of someone with autism being questioned; their role is impartial, so therefore, they are not working for the prosecution or the defense. It would be helpful if we had a similar program implemented here in the United States, as well as in other countries all around the world. This person would be able to act as an autism advocate within the legal system. In the United States, we have autism advocates that assist with Individualized Education Program (IEP) meetings within the school system, but what we need are autism advocates that can be available to help with legal matters also. This system would undoubtedly reduce, if not eliminate altogether, the number of incidents of people with autism giving false confessions. For now, my son continues to deal with an unjust and biased judicial system that makes it almost impossible for him to get his conviction overturned. The legal system is broken, but it can be fixed—all that is needed is for someone to present the complexities of cases with autism and false confessions to people in the justice system. It may take years to set up a fair system for those who have disabilities like autism, but it is my hope that guidelines will eventually be put into place to help protect and prevent people with autism from ever giving a false confession. I hope that this change will happen in the next few years to accommodate the increasing number of children with autism or an autism spectrum disorder. If these changes do not take place soon, then we are going to see more people with autism in prison or jail for crimes that they did not commit. That would be a tragedy! Roberta Hill is a writer, poet, and researcher. She has written various research books and a biography about what it was like to raise her son with autism as a single parent. Roberta Ruth Hill was born in Orlando, Florida. She graduated from high school in 1985 and has had two years of college. She became a CNA (Certified Nursing Assistant) in 1995.